This morning, the U.S. Food and Drug Administration’s (FDA) released information regarding entry line refusals for the month of March. 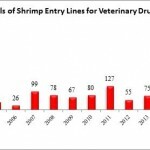 In total, 7 of the 209 (3.3%) of the entry line refusals reported for last month were of shrimp for reasons related to banned antibiotics. In addition, the FDA reported refusing another 7 entry lines of shrimp exported from China and Malaysia with a refusal code of “UNSAFE ADD,” indicating the detection of an unsafe food additive. With respect to shrimp imports, the “UNSAFE ADD” refusal code is occasionally used in conjunction with the refusal codes related to banned antibiotics. However, in each of the 7 refusals reported in the month of March, the “UNSAFE ADD” code was the only refusal code listed and it is unclear what unsafe food additive might have been detected sufficient to have the shrimp determined to be adulterated. Dandong Shenghai Foodstuff Co Lt (China), a company that has not been exempted from Import Alert 16-131, had one entry line refused for breaded shrimp contaminated with veterinary drug residues and nitrofurans in the Atlanta District. Dalian Jinhui Marine Product Co., Ltd. (China), a company that has not been exempted from Import Alert 16-131, had six entry lines refused for shrimp found to have an “UNSAFE ADD” in the Los Angeles District. As the Southern Shrimp Alliance explained in response to the FDA’s reporting of refusals in February, the Chinese and Hong Kong refusals may indicate that in response to the Import Alert on shrimp shipped to the United States from peninsular Malaysia, Chinese shrimp producers and exporters are exploring other ways to enter the U.S. market. These shipments continue to raise concerns regarding the use of banned antibiotics in shrimp aquaculture in China, the world’s largest producer of farmed shrimp. The FDA’s reporting of repeated refusals of shrimp from Minh Phu Seafood and Minh Qui Seafood is particularly troubling. The United States and Japan have reported the detection of banned antibiotics in shipments of shrimp from the Minh Phu Seafood Group over the last several years. The FDA has reported refusals of shrimp entry lines shipped by Minh Phu in each of the first three months of this year. In December of last year, Japan reported violations of its Food Sanitation Law for two separate shipments of shrimp from Minh Phu Seafood Corp. because enrofloxacin was detected in the shipments. In September and October of 2016, Japan reported that there were a total of three shipments of shrimp from Minh Phu Hau Giang Seafood Corp. found to have sulfadiazine. And just a few weeks ago, on March 23, 2017, the Canadian government placed Minh Qui Seafood Pte. 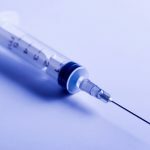 on its “Mandatory Inspection List” for the detection of tetracyclines in its shipments to Canada. Nevertheless, Minh Phu appears to have maintained its certification under the Global Aquaculture Alliance’s Best Aquaculture Practices program. This is remarkable. Since July of 2016, the FDA has listed one of the Minh Phu companies, Minh Qui Seafood, on an Import Alert for the antibiotic sulfamethoxazole and the company has not yet been able to get itself removed from that list. In fact, another Minh Phu company, Minh Phu Seafood was added in February of this year to the same Import Alert for the same reason. Now, in addition to sulfamethoxazole, the FDA is reporting refusing shrimp exported by Minh Phu for the presence of chloramphenicol, for unsafe additives, and for appearing to contain a poisonous or deleterious substance. Two other significant seafood importing markets – Japan and Canada – have also reported issues with shipments from Minh Phu companies. Yet, despite the repeated problems that have been detected with Minh Phu, there appears to be minimal demand from large purchasers of shrimp in the U.S. market that the problem be addressed.